In this Photoshop Effects tutorial, we're going to learn how to simulate the look of infrared photography in Photoshop. We'll be taking a look at Photoshop's Channels palette and seeing how to isolate a color channel as well as how to apply filters to color channels, we'll be using adjustment layers, specifically the Channel Mixer adjustment layer to adjust how much impact each individual channel has on the image, we'll be using a few different layer blend modes, adding some noise, and at the end, seeing how to bring some of the color from the original image back into the effect. The term "infrared" literally means "below red", and without getting into science or color theory, that means we as human beings can't see it. 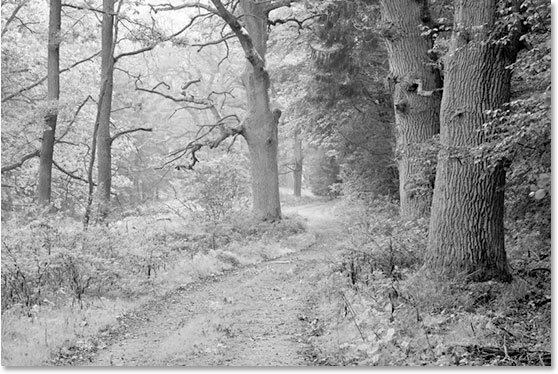 Yet even though you and I can't see infrared light, most digital cameras can, and with the use of an infrared lens filter, infrared photography can bring that light within our visible range, capturing and creating images that have a truly unique, mysterious and otherworldly look to them. Fortunately, this same look can be created quite easily in Photoshop, as we'll see in this tutorial. Since different objects in the world reflect different amounts of infrared light, the results you get with this effect will depend a lot on which type of photo you're using it with. Outdoor scenes with lots of green trees and foilage tend to work best, and that's what I'll be using for this tutorial, but try it out with other types of photos as well to see what you get. Photoshop's Layers palette showing the Background layer containing my original image. 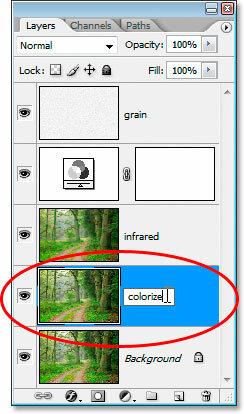 Photoshop's Layers palette now showing the copy of my Background layer directly above it, which Photoshop has named "Layer 1". 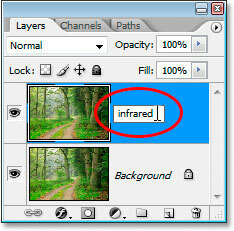 Double-click on the name "Layer 1" and change it to "infrared". 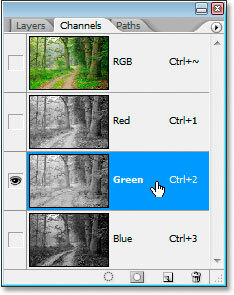 Click on the Green channel in the Channels palette to select it. 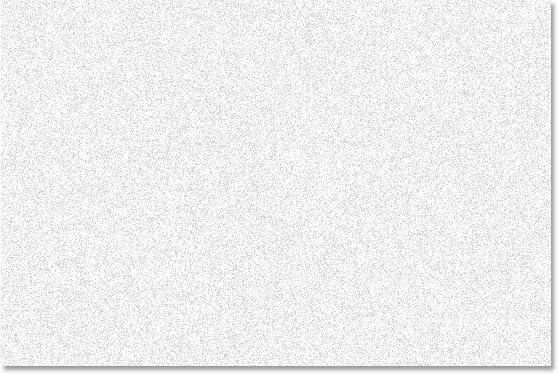 The image turns black and white temporarily. If you don't understand yet how channels in Photoshop work, it may seem odd that when you selected the green color channel in the Channels palette, the image turned black and white instead of, well, green. We won't get into the details here of how channels work, since that would take an entire tutorial on its own, but what you're seeing here is in fact the green color information in the image, not as you and I see it but as Photoshop sees it, since Photoshop sees everything as either black, white, or some shade of gray in between. If that makes little sense to you, don't worry, you don't need to understand it to create this effect. Simply knowing to click on the green channel in the Channels palette to select it is enough. We're going to blur this green channel next. 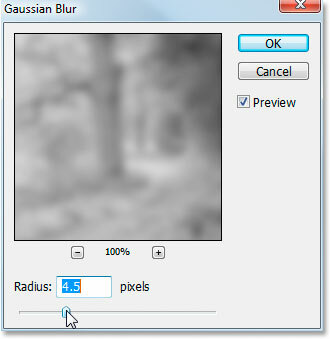 The image after applying Gaussian Blur to the Green channel. Click OK when you're done to exit out of the Gaussian Blur filter. 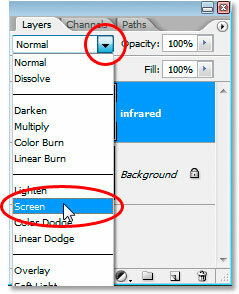 Step 4: Change The Blend Mode Of The Infrared Layer To "Screen"
Change the blend mode of the "infrared" layer from "Normal" to "Screen". The image after changing the blend mode of the "infrared" layer to "Screen". Already at this stage, the image is looking pretty cool, but we're not quite done yet. We're going to be using a Channel Mixer adjustment layer next. 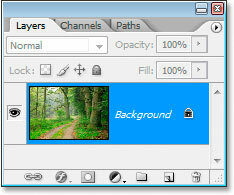 Click the "New Adjustment Layer" icon at the bottom of the Layers palette and select "Channel Mixer". 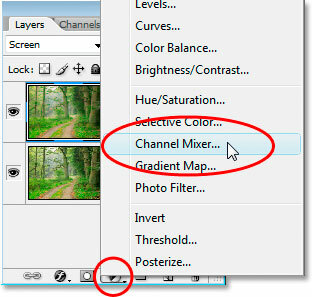 The Channel Mixer adjustment layer's dialog box. I've circled in red the options we need to change. In the "Source Channels" section, set Red to -50%, Green to 200%, and Blue to the same as red, -50%. 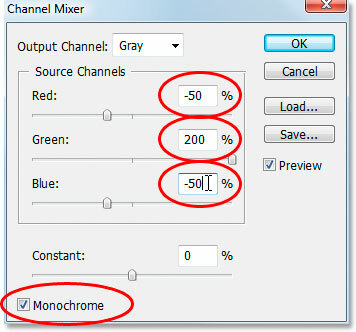 The general rule with these values in the Channel Mixer is that you want to keep the total value of all three channels at 100%, otherwise you'll either be losing contrast in the image or losing detail in the highlights, which is why, in order to set the Green value to 200%, we lowered both the Red and Blue values to -50%, giving us our 100%. Again, not something you need to know. I just like to toss these things out there. 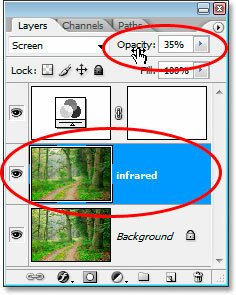 Finally, click the Monochrome checkbox in the bottom left corner of the dialog box to keep the image in grayscale mode. Click OK when you're done. The image after applying the Channel Mixer. 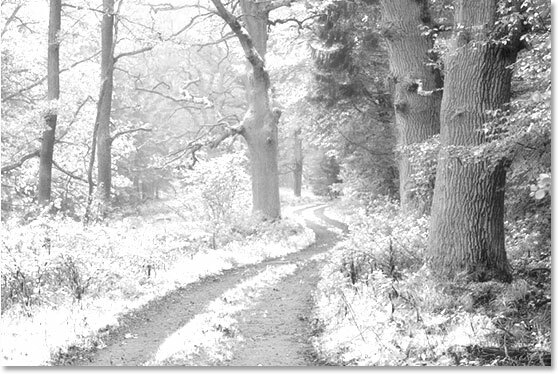 Lower the opacity value of the "infrared" layer to reduce the effect. You'll probably have to reduce the opacity quite a bit. I've reduced mine to 35% in the screenshot above. The image after reducing the infrared effect. The effect is pretty much complete at this point, but it's too clean. Infrared photos typically have a lot of grain in them, so to finish off the effect, we're going to add some noise. 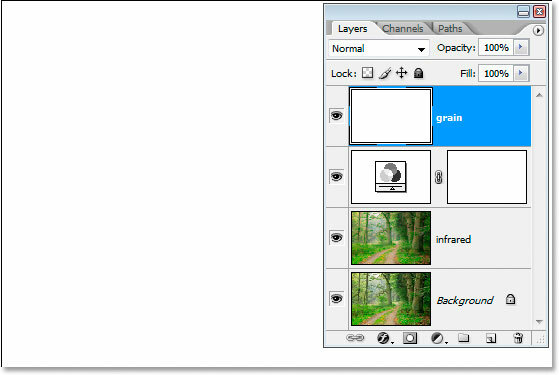 Use the keyboard shortcut to bring up the New Layer dialog box. 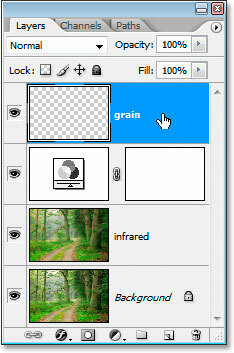 The Layers palette showing the new "grain" layer at the top. Filling the "grain" layer with white temporarily hides the image from view. Select Filter > Noise > Add Noise to bring up the "Add Noise" filter's dialog box. 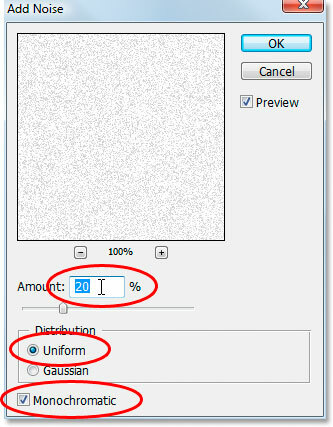 As circled in red above, set the Amount to 20%, set Distribution to Uniform, and make sure Monochromatic at the bottom is checked. The solid white layer is now filled with noise to create the "grain" effect, but it's still blocking the image below from view. 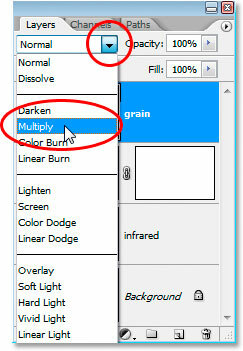 Step 10: Change The Blend Mode Of The "Grain" Layer To "Multiply"
Change the "grain" layer's blend mode from "Normal" to "Multiply"
Setting the blend mode of the "grain" layer to "Multiply" gives us our final infrared effect. 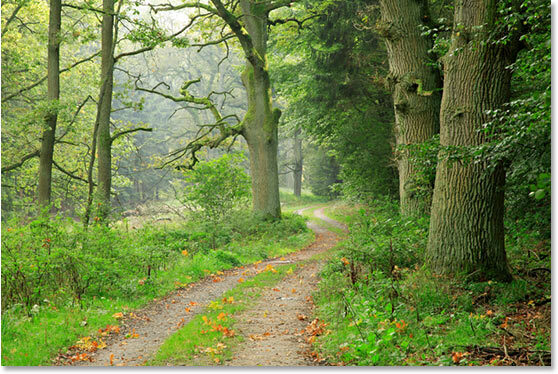 If you find you've added too much grain to the image, simply lower the opacity of the grain layer to reduce the amount. There's one more thing we could do here with our image, and that's to bring back some of the original color. You can of course leave it as is if you want, but if you want to bring back some color, here's how. 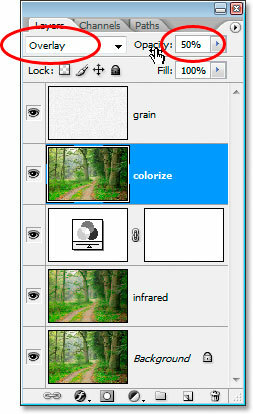 With the Background layer selected, press "Ctrl+J" (Win) / "Command+J" (Mac) to duplicate the Background layer once again, then rename it to "colorize". 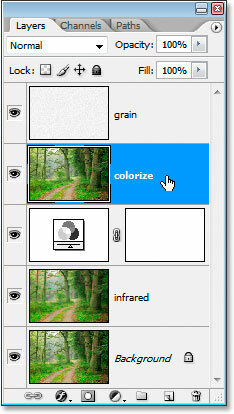 Click and drag the "colorize" layer between the Channel Mixer adjustment layer and the "grain" layer. Set the "colorize" layer's blend mode to "Overlay" and lower the opacity to 50%. The original image once again for comparison. And there we have it! 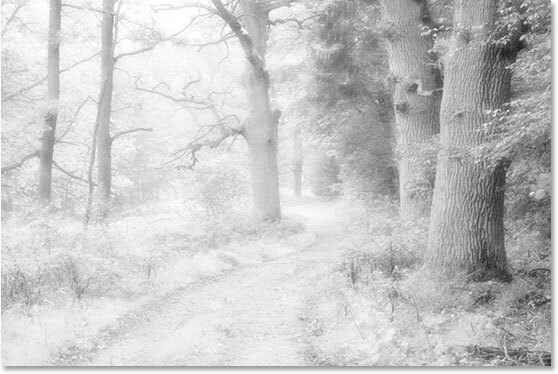 That's how to create an infrared photo effect with Photoshop! Check out our Photo Effects section for more Photoshop effects tutorials!